The bullish engulfing candlesticks pattern signals with high probability, a bullish reversal. It is the opposite of bearish engulfing. In order to be reliable, a downtrend must be in place. Below follows its graphical representation. The green candlestick opens with a gap down but in the end it closes above the open of the previous red candlestick. So we can say that the green engulfs the red one. This is a sign that after a price decline buyers are taking control. Notice that this pattern resembles to the piercing line, the only difference is that the green closes above the open of the red instead of closing above its midpoint. 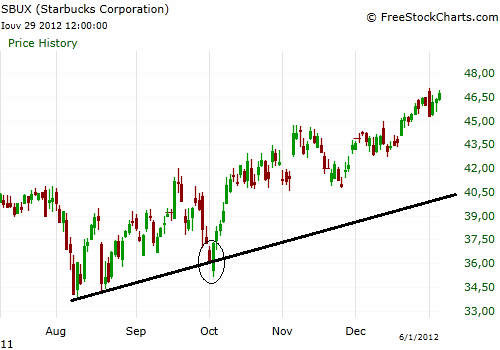 In the context of a midterm uptrend, price is visiting a trendline and simultaneously horizontal support after a short term downtrend (daily chart of SBUX below). When the bullish engulfing pattern is formed we have an additional criterion that the short term downtrend will reverse in a new uptrend. This is by itself a high probability trading set up. Preferably, in order to augment the possibility of success we want the market to be also in a midterm uptrend or forming at the same day a bullish candlesticks pattern after visiting for the first time a support level.